Mariette Rielle is a Breton necromancer. 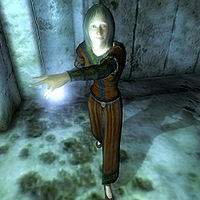 She can be found in the Ayleid ruin of Nenyond Twyll, but the ruin can only be entered once the related quest is active. She has some dark friends, and she's been quite a nasty girl herself. She can be found just at the entrance of Nenyond Twyll Riellesel, never even eating or sleeping, until you make your appearance. At this point she will immediately enter in conversation with you: "Oh, you poor dear. I'm afraid you're late to the party. The guest of honor has already left! And I do hate to disappoint you, but Mucianus is in no condition to be leaving. He's a Worm Thrall now, and shall be quite content here. A grim fate indeed, but one does not cross the Order of the Black Worm without suffering greatly for it. I shall tell the master that you were here looking for him. Perhaps I'll bring him your head as an offering." Although she is a Necromancer she wears the common russet felt outfit and a pair of russet felt shoes as well as carrying a few gold coins. She doesn't wield any weapons, relying instead on a set of leveled necromancer spells. If your Personality is high enough, or if you Charm her, it is possible to successfully yield to her when she first confronts you. However, attempting to speak to her after that will cause her to return hostile. If she survives the quest, she becomes a non-hostile NPC and you can persuade her and ask for rumors. This page was last modified on 16 July 2018, at 20:20.